Core'dinations, May Arts and Stampendous Blog Hop! 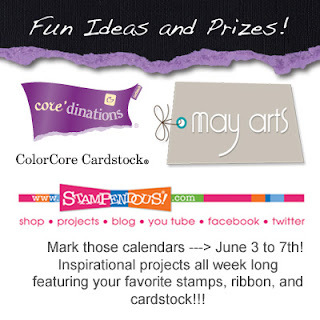 Welcome to Day 3 of the Core'dinations, May Arts and Stampendous Blog Hop! We are hopping all week long and there are some great prizes up for grabs. Each company is giving away prizes on their own blogs and there will be surprise winners on the individual team member blogs as well. Here are my creations for today using Core'dinations, May Arts and Stampendous Stamps. I was sent some fabulous May Arts ribbons and some sentiment stamps from Stampendous Stamps to work with. I used Core'dinations Core Essentials Brights, Core Neutrals and Spotted Jillian Dot on my first card. I layered some Floral/Felt white trim from May Arts over the Spotted Jillian Dot for some added texture. 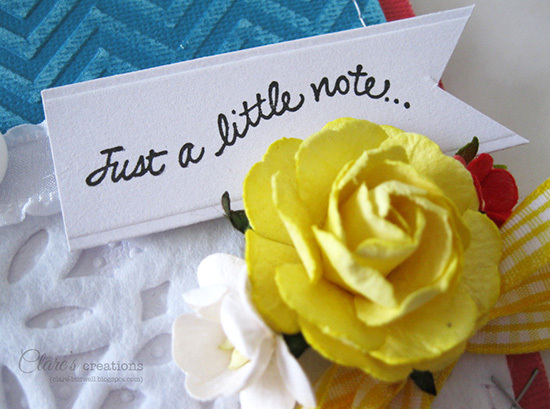 I love that little curve in the Just a Note stamp from Stampendous, I positioned the flower so it just curves around it! The chevron embossing folder is from Crafter's Companion. I also used some Solid Check ribbon and Sheer Ruffle edge ribbon from May Arts. Here's my second card. I love black and white cards and the gorgeous Houndstooth ribbon from May Arts was the inspiration for this card. 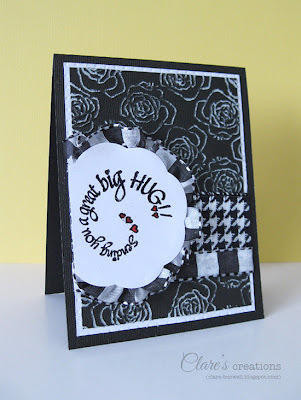 I also used Sending a Hug stamp from Stampendous, embossed using Detail Black embossing powder from Stampendous. The rose garden embossing folder is from Crafter's Companion. I also used some Black Magic cardstock on my card from Core'dinations, I love that collection! Check out who's participating in the hop today! I'm sure you'll be inspired! Don't forget to leave a comment on each of the blogs to be in with a chance of winning some great prizes! Both cards are beautiful...but I LOVE yellow, and that card is so gorgeous with all the yellow ribbon, and flower!! Clare, your cards are so striking. You so creativity showcased the stampendous stamps!!! Nice core cards and may arts is like icing on the cake!!! Gorgeous cards! I love the embossing folders you used! Love all the layers on the first card! The second card is done in my favorite colors I you consider black and white colors! (I DO) Thanks for sharing your great cards! These are both beautiful. I love the little details on both such as placing the flower in the curve of the sentiment on the first and I love the black and white with the touch of red. Beautiful cards! I love the yellow flower! Love the yellow accents on the first card and the black/white color combo on the second. The embossing adds a great element. Nice colors, too! Love your cards! The first one is so colorful and cheerful. Thanks for sharing your creativity with us. Love your beautiful cards and the black and white is just delightful! Both cards are great but the black and white card really stands out. Love the blue and yellow mixture on the first card. Beautiful cards - so delicate and elegant! Love them! love these cards, they do have a sense of movement. Clare, these are just darling cards! So fun and full of festive embellishments! Thanks so much for playing with us this week! Both cards are so pretty, love the designs on them!! Great use of ribbon on both cards. The texture and colors are fantastic on both cards! I am partial to black and white, but that blue/yellow one is gorgeous! I like your black and white color scheme. I've never tried that in my crafting. Your cards are amazing! Both have such wonderful layouts and dimension to them. Love all the texture! Love the spiral Hug sentiment. Also love the blue/white/yellow colors of the other card!! The black and white card is so elegant looking. The ribbon just sets it off perfectly. The stamps and the papers along with the ribbon and such make each one unique. Thanks for sharing. Both cards are great; love the yellow flower, and I adore the swirl sentiment! Great cards! My favorite is the black and white one! Fabulous cards, thanks for sharing! Both cards are awesome but really love the look of the black card the best!! Both cards are fabulous. I must admit I am partial to the black and white one but not by very much. Your layering is excellent on both cards. WOW - TWO FABULOUS cards Clare!!! love the yellow on the first one - especially the flower. Beautiful cards you are showing off today. Your use of embossing folders really makes the Core'dinations papers shine! You used basic primary colors and basic black and white and both cards are superb! The way the Sending a Hug stamps swirls makes me hapoy. TFS! Beautiful card. I love the chevron and the colors. Wonderful job. Beautiful cards, Clare! I am nuts about the embossing folders you chose and the great sanded effect! Loving the layers. Especially love the black and white card. it "speaks" to me! Super cards, love the ribbon and embossing! 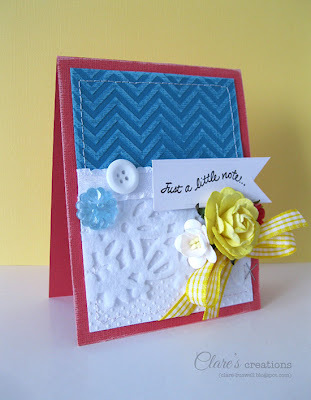 Two cute cards, embossing is my new obsession and chevrons are everything! Thanks for sharing. I am obsessed with embossing folders and love that modern chevron too. You did a great job on the black and white card.